Caffeine levels in coffee can vary dramatically by the type of bean and how much it’s roasted. Even different beans taken from the same bush can have different amounts of caffeine. The way coffee is prepared will also affect how much of the bean's caffeine winds up in your cup. Two species of plants make up almost all the commercially produced coffee beans in the world. By far the most popular is Arabica, accounting for about 75 percent of all coffee beans. A typical Arabica bean contains 1.2 percent to 1.8 percent caffeine. Canephora, also called robusto, contains as much 50 percent more caffeine than Arabica beans, reaching as much as 2.4 percent. Canephora is a more acidic and bitter-tasting coffee bean that is often used as a filler in primarily Arabica grinds or for very dark espresso roasts. 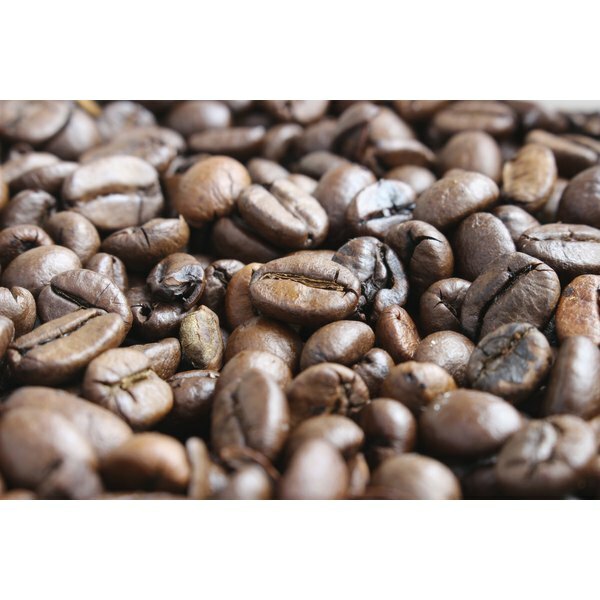 Other varietals and their caffeine content include Tanzania peaberry with 1.42 percent, Yemen mocha with 1.01 percent, Guatemalan with 1.20 percent, Kona with 1.32 percent and Ethiopian harrar with 1.13 percent. Contrary to popular belief, roasting coffee beans does not increase the caffeine content. While dark roasts have a richer, stronger flavor, they often contain less caffeine because the roasting process actually reduces caffeine by 10 percent to 15 percent. A dark-roasted bean typically will have 15 percent to 20 percent less caffeine than a lighter roast of the same variety. Roasting of coffee beans lasts only 10 to 15 minutes, but involves temperatures in excess of 350 degrees. How coffee is prepared also will affect the caffeine content of the bean that makes it into your cup. Espresso is a concentrated method of preparation, which yields single-ounce servings with 30 to 50 milligrams of caffeine. Drip coffee has less caffeine content but is often consumed in larger quantities. According to a report in the "Journal of the American Dietetic Association," a typical cup of drip-brewed coffee has from 107 to 151 milligrams of caffeine, depending on the roast and varietal of the bean. Eight ounces of drip Arabica can have as much as 200 milligrams of caffeine. As the caffeine content of brewed coffee shows, coffee beans are potent sources of caffeine. For example, a 12 ounce soda has 40 to 50 milligrams of caffeine, about the same as a single shot of espresso, but much less than a typical cup of brewed coffee. Green tea contains only one-third or less of the amount of caffeine in Arabica beans. Only dark chocolate has anything close to the same amount of caffeine, with 50 to 100 milligrams of caffeine in a 6 ounce bar. Decaffeinated coffee is historically produced by soaking green coffee beans prior to roasting in a solvent that extracts caffeine from the beans. Unfortunately, the process also removes many of the chemicals that contribute to coffee’s overall flavor. As a result, decaffeinated coffee typically has a unique taste. In the United States, decaf coffee must be 97 percent caffeine-free, meaning a 6 to 7 ounce cup will still have 3 to 6 milligrams of caffeine. In 2004, scientists studying thousands of Ethiopian coffee plants identified three types that had virtually no caffeine. It is believed these varieties can be used to produce a richer-tasting, low-caffeine coffee.